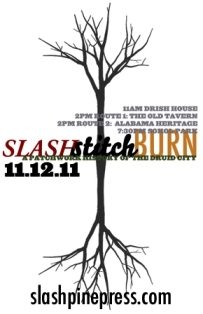 Slash Pine Projects at The University of Alabama presents Slash Stitch Burn: A Patchwork History of the Druid City on Saturday, November 12, in venues across Tuscaloosa. Each focuses on history, poetry, and prose inspired by each venue and features collaborations among words, music, and visual and performance art. The events are free and open to the public. The three-part event will begin at 11 a.m. with a reading in Drish Mansion, a former plantation house south of downtown Tuscaloosa. At 2 p.m., the event continues with two simultaneous alternative-history tours, one of downtown Tuscaloosa and one of the UA campus. Both feature works that stitch together real and alternative histories of Downtown and campus sites. Both walks will begin promptly at 2 p.m. and end at approximately 3:30 pm. Tour 1 starts at the Kilgore House, headquarters for Alabama Heritage, on the UA campus and concludes at the new courthouse between campus and downtown. Tour 2 starts in the courtyard of the old tavern on the edge of Capital Park and also concludes at the new courthouse. Both tours will take place at the same time and will be independent of each other. Each will involve about a mile of walking. The campus walk will include Kilgore House, the basement of Gorgas Library, the mound on the quad, and the Walk of Champions. Prominent landmarks on the downtown tour include the old tavern, the old jail, the Bama Theatre, and the new courthouse. At 7 p.m., Slash Stitch Burn concludes with a bonfire reading in the wilderness and shadows of Sokol Park. Readers include UA faculty members Robin Behn and Wendy Rawlings; Catherine Pierce, a faculty member of Mississippi State University; and Chad Simpson, a faculty member of Knox College in Illinois. Other notable readers, musicians, and artists include Chris Mink, Daniela Olszewska, Laurence Ross, Matt Myrick, the Slash Pine interns, and students from Knox College. Support for Slash Pine Projects comes from UA’s English department and Creative Writing Program and UA’s College of Arts and Sciences. For more information, visit www.slashpinepress.com.